This project restored the dune area that was destroyed by off road vehicles and other human uses. One trail has been improved for accessing the beach. Two existing pedestrian trails have been left open for scenic views of Lake Michigan. All other trails are CLOSED to off road vehicles and pedestrians. Van Buren County received permits and has completd the trail grading work and fencing installation at Syndicate Park Dune. Van Buren County requested bids for the grading work and those bids were due April 7. See request here. Plantings - Dune grass and shrubs were planted in 2017. SWMPC is still working to secure additional grants for Van Buren County to do more dune grass plantings and additional fence installation if needed. Multi-use trail at the end of Grand Avenue - The trail was widened to 10 feet with the fencing placed along it. All other trails are now closed to off road vehicles. Walking/Hiking Trails - There are now only 2 walking trails available for use on the county's property. The first one branches to the right off the multi-use trail before you go up the big hill. This trail is not being improved as part of the project, but it is being left open for those that do not want to walk on the multi-use trail to get to the beach. Please note that there is a big drop off at the beach. The second walking trail is to the south of the Grand Avenue trail. This trail is not being improved, but it will be lined with fencing and we ask that everyone stay on the designated trail to promote dune grass restoration on the rest of the county's property. There is a small opening in the fence along the beach with a sign indicating that this is a hiking trail. The trail is a two way path that leads you up to a high point on the dune for a beautiful view of Lake Michigan. There is an opening part way up the trail to the left that leads to a private parcel of land. Please do not trespass on this private property. Signage and Video- Signs have been erected to direct people to stay on designated trails. The signs were developed by the Van Buren Conservation District (VBCD), the Southwest Michigan Planning Commission and Preserve the Dunes. Bruce Sirus has generously donated the production of the signs and has installed them. His contribution counts towards local match for the MDEQ grant. The video for the project can be viewed here. Preserve the Dunes paid for the video. 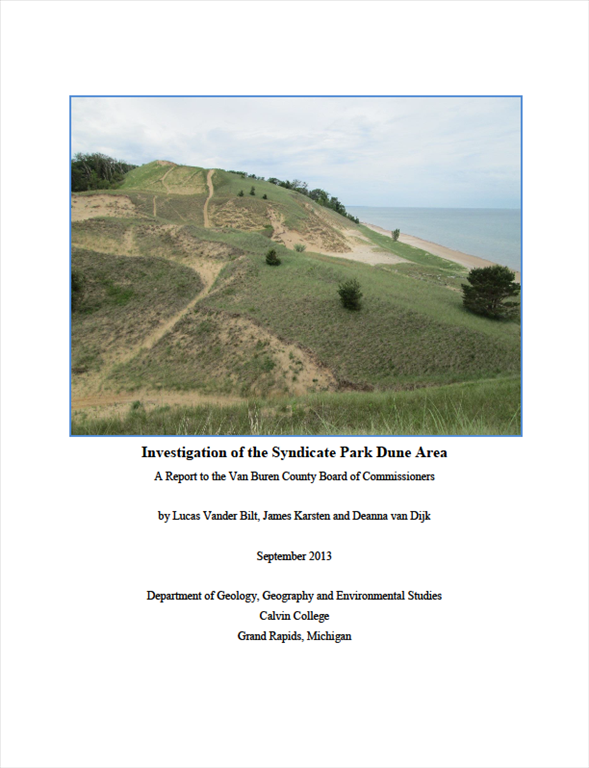 Van Buren County was awarded a grant from the Michigan Department of Environmental Quality, Coastal Zone Management Program to begin implementing the project site plan which includes planting dune grass, erecting fences and improving the multi-use trail at the end of Grand Avenue to the beach. The County continues to apply for grants to complete additional site work. Van Buren County will keep the walking trail that splits off to the north of the multi-use trail open for those that want to walk to the beach and avoid ORV traffic on the multi-use trail. A landowner meeting was held on Saturday, August 15, 2015 from 9:00 a.m.– 11:00 a.m. at the South Haven Township Hall, 09761 Blue Star Memorial Hwy, South Haven, MI 49090. At 9:00 a.m. there was a short project overview presentation. Following the presentation there was an open house question and answer time with the project team. The concept plan was available for review. In 2014, Van Buren County was awarded a grant to conduct engineering and design of a dune restoration project on county-owned property. Van Buren County hired Abonmarche and Cardno JFNew to complete this work. - to provide education on dune ecosystems. If you have any questions or concerns about this project, please contact the project manager at the Southwest Michigan Planning Commission, Marcy Hamilton at hamiltonm@swmpc.org. 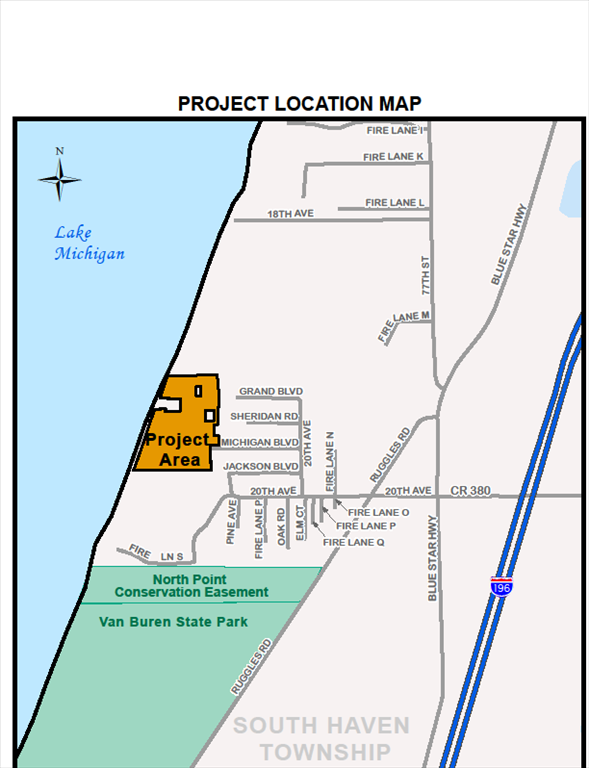 Van Buren County owns 25 acres in Syndicate Park in South Haven Township along Lake Michigan. Most of the county-owned property is critical dune. Over the past few years, the Van Buren County Board of Commissioners established a committee and conducted studies to develop a recommendation for the future of county-owned land in Syndicate Park that: 1) recognizes the property’s unique features and the constraints and opportunities associated with these features; and 2) incorporates the public’s desires. From this work, the Syndicate Park Dune Project is underway. The main goal of this project is to restore a large critical dune complex and limit impacts from human use with providing managed public access and educational opportunities. The project area is adjacent to other protected dune areas, including North Point Conservation Area, a county-owned park recently protected by a conservation easement held by the Southwest Michigan Land Conservancy. The 17 acre North Point Conservation Area with 330 feet of Lake Michigan beachfront is adjacent to Van Buren State Park (400 acres with 1 mile of Lake Michigan shoreline). The project area is part of the world’s largest freshwater dune system, which stretches miles along the southern and southeastern shores of Lake Michigan. Coastal sand dunes around the Great Lakes constitute vital and distinctive environments that support more unique species of plants, insects, and animals than any other ecosystem in the Great Lakes Basin. by human use, is threatening residential structures and allows for public access and educational opportunities. The public will be involved in the design and engineering process to ensure that the trail system meets residents/visitors needs, but does not jeopardize the dune ecosystem restoration. The County, Township, City and State Park officials will continue to be involved in the process to ensure public access is provided in a manner that can be managed effectively by officials. This project is consistent with local and regional plans. At the regional level this project advances the Growing Greener in Southwest Michigan effort and the Van Buren County Community Park, Recreation, Open Space and Greenway Plan (2011). Locally the South Haven Charter Township Master Plan (2009) recognizes the importance of critical dune areas. The Syndicate Park dune area is designated as "Conservation" on the 2009 Future Land Use Map for South Haven Charter Township. In addition, this project is based on recommendations from two recent studies (2012 and 2013) specifically addressing the Syndicate Park County-owned property. To view or print this Project Location Map Click here! Financial assistance for this project was provided, in part, by the Michigan Coastal Zone Management Program, Office of the Great Lakes, Department of Environmental Quality, under the National Coastal Zone Management Program, through a grant from the National Oceanic and Atmospheric Administration, U.S. Department of Commerce. The statements, findings, conclusions, and recommendation are those of Van Buren County and do not necessarily reflect the views of the Department of Environmental Quality and the National Oceanic and Atmospheric Administration. This page last updated on 3/29/2019.